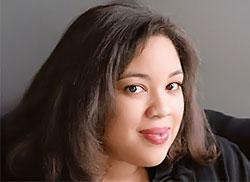 Fiction writer Danielle Evans will be reading at Penn State Behrend on Thursday, Oct. 6, as the concluding speaker of the Creative Writers Reading Series. Fiction writer Danielle Evans will be reading at Penn State Behrend on Thursday, Oct. 6, as the concluding speaker of the Creative Writers Reading Series. Her writing tackles the serious issues of race and identity with humor, irony, and compassion, and she never lets the gravity of her subject overcome her clear delight in words. Evans? stories have appeared in The Paris Review, A Public Space, Phoebe, and Callaloo and have been included in The Best American Short Stories 2008 and 2010. Her short story collection Before You Suffocate Your Own Fool Self won the 2011 Paterson Prize for Fiction among other awards and was named one of the best books of 2010 by Kirkus Reviews and O Magazine. Ethan Brightbill: Many of your stories discuss race. Considering that many other great writers have also focused on the subject, how do you keep your work fresh and original? Danielle Evans: There?s a running joke in creative writing classes that there are only (2 or 5 or 7?the actual number varies) stories in the world, and we just keep telling them over and over. I think the saving grace is that with fiction, you?re writing about not just what happens, but how and why, and the how and why are what make the work unique in way that hopefully lingers?often this comes down to creating characters who feel fleshed out enough to be distinct and memorable. I don?t particularly worry about race limiting originality. I teach African-American literature in addition to creative writing, and while certainly many classic African-American texts are in conversation with each other somehow, they are very rarely saying the same thing. There are as many stories about race as there are people in the world?everyone has some kind of racial identity and some kind of relationship to the racial dynamics in their community, whether or not it?s something they dwell on. Since there?s no such thing as race without context, writing a story that deals with race or racism also means that as a writer you have to be able to really define your territory, in terms of time and place and culture, and so you?re starting from a point that?s specific and often unique. EB: You already have a collection of short stories out. Do you believe you will ever publish a novel? DE: I certainly hope so, because my novel is due to my publisher next week! It is a bit of a different writing process. It?s been fun to be able to write a book that can shift perspectives and have more things happening at once. I think of short stories as going for precisely that moment where something changes forever, and ending right as we can feel the impact of that and imagine how it will reverberate, but a novel is more like starting from that point of change?instead of building toward an explosion, it?s like playing with a pinball machine?you start writing with a sense that something has been set in motion and you?re figuring out what happens next and how it leads to what happens after that. EB: Which other writers have influenced your work? DE: I think it was important to me to read writers like Junot Diaz and ZZ Packer in college, because they were writing about a world I recognized, and I hadn?t known before that that was possible. Amy Bloom and Alice Munro are I think geniuses especially when it comes to the short story form, and reading their work always leaves me astonished by how much a story can do. Writers like Edward P. Jones, Toni Morrison, and John Irving I read for the pleasure of their language and the scope of their work, but also because they?re good writers to read as a writer?everything in their books is so perfectly and intricately structured, and I think as a writer you have to be able to think about structure in a way that you might not when you?re just reading for pleasure. EB: You have a number of excellent articles posted on your website. Have you ever considered writing creative nonfiction for print publication? DE: Not really. My first love is fiction. When I was in college, I wanted for a while to become an anthropologist, and part of what stopped me is that I did not want to commit to a life where I wasn?t supposed to make things up, if I felt like I could invent a story that was better than the real thing. I do keep the blog, and I?ll comment on something if it interests me, but I always remind myself that it?s not my first priority. There?s a way that blogging is instant gratification?you write something, you put it on Facebook and Twitter, you get instant reaction?and I think in some sense that instant gratification is dangerous for me as a writer whose real work is a process that takes years and long stretches of radio silence. I do occasionally write book reviews, but I always feel slightly strange about that and end up swearing I?ll never do it again. EB: Do you have any advice for aspiring fiction writers? DE: My main advice is to focus on the creative work first and above all else. A lot of things about publishing are confusing and distracting, and none of them will matter if you don?t have a piece of writing that you believe in and will stand by. What I learned in graduate school was not so much how to write, but how to edit, and as part of that, how to articulate to myself what I was trying to do. I think it?s useful for all writers to have that kind of internal discourse. The reading will be held in Behrend?s Larry and Kathryn Smith Chapel at 6 p.m. A reception for the author will be held at 5:30 p.m. Behrend will also host student senior thesis readings on Thursdays, Nov. 10 and 17. All events are free and open to the public. The Penn State Behrend Creative Writers Reading Series welcomes Erik Reece. Ethan Brightbill offers some insight to the author with this Q&A.